In early April this year, Russian Prime Minister Dmitry Medvedev visited Vietnam. The trip has been viewed as a continuation of Russia’s policy of deepening ties with Asian countries amid worsening relations with the U.S. and Europe over the Ukrainian crisis. The outcomes of the visit underscore the interest that Russia and Vietnam have in setting up cooperation in a number of areas. In particular, the two countries discussed the possible signing of a free trade agreement between Vietnam and the Eurasian Economic Union by the end of 2015. Gazprom subsidiary Gazprom Neft and Vietnam’s state-controlled oil and gas company Vietnam Oil and Gas Group (PetroVietnam) meanwhile signed a memorandum to extend cooperation in oil and gas production and exploitation on the Russian continental shelf in the Pechora Sea, and agreed on general provisions for Gazprom Neft’s acquisition of a share of the Dung Quat refinery. Russia’s interest in promoting relations in the energy sector is influenced by the current global political and economic situation. Western sanctions, combined with European attempts to become less dependent on Russian gas, have made a turn to Asia more desirable for Moscow. Similar statements were expressed in relation to Russian President Vladimir Putin’s visit to India in 2014. Russian Deputy Minister of Energy Yuri Senutin proclaimed that “for the first time ever Russia has suggested to the Indian companies participating in projects in development and production of hydrocarbons in Russia, including in the Arctic and in East Siberia.” Such initiatives testify that an idea to involve Asian companies in energy projects has received support not only from the Russian energy companies (Rosneft, Gazprom and Zarubezhneft) but also among Russian political elite. Additionally, Russian energy companies view the strengthening of cooperation with Vietnamese companies as a way to diversify export markets, find new investors in their energy projects, and expand their presence in energy projects in Vietnam. For its part, the Vietnamese energy company PetroVietnam is keen to stake out a share in Russian oil and gas projects, while assessing the economic costs and benefits, and possible risks. One of the first opportunities for Vietnam to get access to the Russian shelf dates back to 2012, when the Russian state-controlled oil company Zarubezhneft and PetroVietnam expressed an interest in creating a joint venture for oil and gas exploration in the Barents Sea. In 2011. the acquisition by Zarubezhneft of 100 percent minus one share of Arktikmorneftegazrazvedka, which boasts vast offshore production experience, has created the conditions for the company to meet the legal criteria for offshore production. In line with the 2008 amendments to the federal law that authorizes a legal entity to operate on a shelf, a company must have five years’ experience in developing deposits on the Russian continental shelf; be established in accordance with the legislation of the Russian Federation; and have more than 50 percent of its charter capital owned by the government. 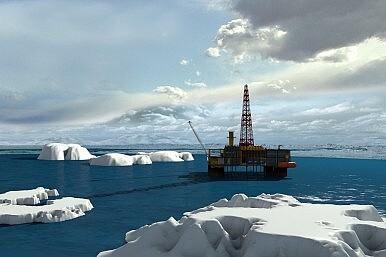 Since then, Zarubezhneft has tried to apply for licenses on Arctic offshore areas; however, despite debate within the Russian government and strong support from the Ministry of Natural Resources and Environment the decision to liberalize access to offshore production has yet to be made. One reason is the strong opposition voiced by Rosneft and Gazprom. Opening up access to offshore oil and gas fields would end their existing monopoly over offshore production in the Arctic region. Like Gazprom and Zarubezhneft, Rosneft has also expressed an interest in developing energy projects together with PetroVietnam. In 2014, the two companies reached an agreement to set up a joint venture to develop two oil field blocks in the Pechora Sea. Although the statements have been made by Rosneft head Igor Sechin concerning the company’s plans to expand cooperation with PetroVietnam, the companies are still negotiating conditions for joint offshore activities. Given the current geopolitical situation, as well as Russia’s own economic challenges, it is hard to see in the short term at least changes in Russian regulations related to the liberalization of access to offshore production or major increases in offshore activity in the Russian Arctic zone. Rosneft and Gazprom have already requested permission to postpone their offshore projects in the Arctic. In particular, last month Gazprom Neft announced that it would be postponing until 2031 the Dolginskoye offshore project, which the company plans to develop in partnership with PetroVietnam. Given the circumstances joint development of onshore projects in the Arctic appears more likely, especially since PetroVietnam is already engaged in oil production in Russia. In 2012, the company established a joint venture in partnership with Zarubezhneft called Rusvietpetro to develop a cluster of oilfields in the Central Khoreyversky uplift in the Nenets Autonomous Area. And in June 2015, the heads of Gazprom and PetroVietnam signed an agreement on major terms and conditions for projects to develop the Nagumanovskoye (Orenburg region) and Severo-Purovskoye (Yamal-Nenets Autonomous Area) fields. Apart from Arctic oil and gas resources, as a major fishing nation Vietnam could also be interested in Arctic fisheries. Since 2015, the five Arctic coastal states (Russia, Canada, U.S., Norway, Denmark) have been holding negotiations on commercial fishing in the central part of the Arctic Ocean beyond the 200 nautical miles of the exclusive economic zones. One of the preliminary results of negotiations was the signing in July 2015 of a declaration on the prevention of unregulated High Seas fishing in the Central Arctic Ocean that put certain limitations on fishing in the area. However, with the opening opportunities for fishing in the central part of the Arctic Ocean interest from non-Arctic states, including Vietnam, is likely, and these states could well become involved in future governance of Arctic fishing. Official representatives from China, Japan, South Korea, Iceland and the EU took part in a meeting in Washington D.C. at the start of this month to discuss policy approaches. In general, large-scale cooperation between Vietnam and Russia in the development of Arctic energy projects is unlikely in the short term. Over the long term, however, as sanctions are eased it is possible to foresee a partnership between Russian, Vietnamese, European and American energy companies for joint exploration and exploitation of hydrocarbon resources in the Russian Arctic zone. Nadezhda Filimonova is head of the World Meteorological Organization Relations Department at the Russian State Hydrometeorological University. The economic and political logic behind Gazprom's use of a Chinese drilling rig in the Arctic.